You, perhaps, are doing all three. Your folk decided to send you away to Chicago when they found out about the guitar player who was teaching you to slide your fingers along the strings, who had hazel eyes that changed from green to gold and back depending on the weather of their mood. Who smelled of Hoyt’s Cologne and Royal Crown pomade to smooth the almost red hair under the fedora. The guitar player who stood behind you under that big oak tree in Flora, Mississippi and wrapped strong, muscular arms around your waist. Who settled the guitar right at your center so you could feel it thrum, thrum, thrum, thrum like a heart against your belly. Your family yelled at you about your virtue and bringing a pickanny into this world who nobody had money to feed. They were Holy Ghost shouting Pentecostals. This wasn’t the worst insult, though. When your brother was sent to fight the guitar player for your virtue, he found that you were in no danger at all of getting pregnant because beneath that fedora was a fall of sandy waves that would put your high yellow aunt to shame. And lower, beneath the belt buckle, even though your guitar player wore briefs under fine gray trousers, y’all were the same. 2. Travel by train, bus, car, feet. On this, your first trip North, your family does not trust putting you on the train or a bus. They know that your beau will find a way to meet you along the path and secret you away. Your mother has filled her best suitcase, a fold-down travel affair that the white lady she does domestic work for gave her. It was the most beautiful thing you have seen. Cardboard wrapped in pale grey linen with red handles. All of your prettiest, most girly dresses are packed. Slips and nylons that you are wearing even in this heat. You will later learn that the suitcase is a throwaway thing that they give to white train travelers for free. It is still beautiful to you. Before you left, your mama anointed the car with blessed oil from the preacher, and you can’t figure out how it is different from the Hoyt’s Cologne that your beau douses his rabbit foot with for luck in gambling. Your father and your brother smash you between them in the borrowed '55 Chevrolet and plan to drive ten hours straight up to Chicago. They tell you there will be no stops. You are traveling the first bit through the dark of early morning. You ate your shoebox lunch almost as soon as you got in the car. The fried chicken, lemon pound cake, boiled egg, and the bottle of your mama’s best sweet tea long gone by then. Your stomach rumbles, and it reminds you of the thrum, thrum, thrum of the guitar on your belly. When you look into the inky dark night, you remind yourself that you and your beau are still under the same sky. 3. Arrive alive or nearly so. When you beg, beg, beg that you have to pee, your father stops beside a field in the dark for you to relieve yourself, quick. He and your brother remind you that pretty much all of Mississippi is a sundown town. You hate your father and brother a little for trying to scare you even more, but regret it when you see the blue police lights behind you about an hour out of Memphis and your daddy pulls the car to the shoulder of the road. You are thankful to be your family’s prisoner. Smashed between your daddy and brother and the gearshift when the white man comes and shines a flashlight through the window. He isn’t dressed as a police officer, but the pulsing blue light behind you makes it true. You know that there is a .45 pistol under your daddy’s seat and another pistol in the glove box, but that means nothing with a white man with his hand on his holster. Your father takes this trip every few months to see his older brother who lives in the city. He has little wieners, and souse, and liver cheese, and jars of chow chow for him in a cooler filled with ice. Things that he can’t get up in Chicago. You keep thinking about the ice melting and the food going bad while this white man decides what to do with you and your family. The white man’s voice becomes a frequency that you cannot decipher. All you hear is a stream of YESSIR, NOSIR, YESSIR, NOSIR, NOSIR, NOSIR, YESSIR in your daddy’s voice that seems as if he is yelling up from the bottom of a well. MY WIFE IS SICK, SIR. I AM TAKING MY CHILDREN TO RELATIVES IN MEMPHIS AND A MAN NAMED JIM BRITTON HAS WORK FOR ME. PUBLIC HAULING, SIR. TO GET SOME MONEY FOR MY SICK WIFE. You hear this clearly because it is a lie. The first known lie you have ever heard your daddy tell. YESSIR. YESSIR. I’LL GET IT SIR. Your father holds up his hands, reaches across you and your brother to the glove box, and passes the officer a card. The officer shines his flashlight on the card, but there is no need now. The sky is lit up with a brilliant tangerine sunrise. He spits a stream of tobacco juice on the ground, and it is as if all your senses are coming back. You can smell his whiskey sweat and powdery women’s perfume. You can see the broken brim of the straw hat he wears and the faintest remains of a black eye still healing. Y’all be safe out here. Get on to Memphis now, boy. You feel your brother almost jump at the “boy,” but you both know that it is meant for your father. The car finally pulls away from the shoulder as if it is driving itself, but your daddy’s hands are there on the steering wheel. You now know why your daddy does not believe in trips for leisure. You go where family is and that is that. Weddings, funerals, family reunions, babies being born, trouble. These are the reasons for travel. 4. Follow secret hopes, abandoned dreams, unquenched desires. Ought to be able to pick up WDIA strong now, your daddy says. He turns the dial on the radio to AM 1070. You usually have to fiddle with the station to get WDIA, but it is strong and clear. In the house you only listen to gospel or nothing at all. Your beau played WDIA for you in the little trailer he lived in with the folks on the chitlin circuit. You are surprised that your daddy even knows the call numbers for the radio station. The music seems to be unfurling the terror with the police officer from around your daddy. His jaw starts to unclench, and he taps his knee. You pretend not to know the song, but your beau played it for you on the guitar. “Prove it on Me Blues,” by Ma Rainey. You raise your eyebrow at your brother who pretends that he doesn’t see your daddy enjoying the devil’s music, and keeps his eyes glued to the Texaco Road Atlas and a several-years-out-of-date Green Book he got from a man who was buying new ones at the dry goods store in Flora. Your brother likes to practice being in charge, so he points out places that you could stop along the route (but that you won’t). You usually sleep through these trips, but you fight to stay awake, even when your head drifts onto your brother’s shoulder for a moment. You try to memorize the highway numbers, watch your brother’s fingers as they trace the way along the lines for the highway. Your father goes the way that he knows—Highway 51 straight up through Memphis. When you cross the state line into Tennessee, he looks at his watch. I used to live in Memphis once, your daddy says. His big square jaw melts into that soft half-smile that you love. He isn’t looking at you, though. He is looking straight ahead at the road that is becoming the city around you. You watch the flash of shock on your brother’s face. He did not know about Memphis but doesn’t want you to know that he didn’t know. Your father had a whole life that you didn’t know about. You look at his face to see if you can see the secrets that could be hidden underneath his furrowed brow and restless hands. Let’s see if you as good at reading that map as you are at holding it, your father says without even looking over at your brother. See if you can find Beale Street. You watch your brother’s anxious hands hover over the map to find where you are along the highway. You know where south is? your father asks. We came from the South, your brother says, and your father nods. You watch him lean over the map in his lap tracing up from your county of departure. His hand seems to tremble a bit at where you got stopped, but you convince yourself that you are imagining this. He then flips the map over to look at something in the corner. You are proud of your brother and forget for a bit that he is your jailer. Keep north on 51 until we get to Kerr. That’s good, son. But we’ll go on up to South Parkway. Then I can show you where me and your uncle used to live. Can you believe that Black folk live in these houses? Make a right up here, your daddy says. You are still watching every sign for a way to get back to your love. When you see the street, your mouth flies open like a screen door in a gust of wind. Mississippi! You moved from Mississippi to stay on a street called Mississippi! It is the first time you have spoken all trip. How quickly the sound of your own voice became unfamiliar to you. You don’t put your hand up to your mouth to press the words back but clasp them tightly together in your lap until they ache. Your dad pulls up to a stop in front of the building he pointed to and folds over in laughter. Your brother does too. You must love Mississippi, Daddy. You don’t laugh, but you do smile, and your body feels something other than the sad ache you have felt since they ripped you away from your lover. Your daddy doesn’t get out of the car at the apartment house where he used to live. You can feel his want there in the car with you. It’s never occurred to you that your father was just a person who had his own private wants. What did you do when you lived in Memphis, Daddy? your brother asks. Your uncle and I did do public hauling for a man named Britton. A Black man. Looked almost white. Coulda passed. But was a Black man. Listed in the directory and everything. A Black man? Yep. So that was real? He had his own business and we worked for him. But who cooked? Who cleaned? Your daddy chuckled. We did. You try to imagine your father with a broom or skillet and can’t work it out. Your father points out the hotels and businesses that cater to Black clientele. He even drives you down Beale Street that sounds like church music at dusk and smoked meat. Keep her in the car, your father says to your brother, and you are a prisoner again. He pulls up at the curb again and goes into a pawn shop. See the three gold balls, your brother says when your father is out of the car. That’s how you know it’s a pawnshop. See the pole that looks like a Christmas stick of peppermint? Barbershop. Your father isn’t in the shop for long, but when he comes out, something about him is different. Heavier or lighter? It is difficult to tell. 5. Surrender to old hungers. Let’s get something to eat. We are gonna go to my favorite place from way back when. You know how to get back to Mississippi? your father asks. Mississippi where we live or the street? Well, I lived at both, your daddy says. The street. Your brother doesn’t hide his shock this time but gets busy directing your father with the map. You arrive at a place called The Four Way Grill, and your mouth is watering. You are hungry because you long since ate your shoebox lunch and are always hungry. Your brother has been saving his, the fried chicken going soft and the boiled egg overheated. He always delays his pleasures until the last possible moment, but you have always wanted as much as you can get, now, now, now. You can count on one hand the times that you have been to an actual restaurant. 6. Try to escape the past. Fail. You are already calculating what you want to eat. The restaurant is full, and you are self-conscious because what you thought were your fancy traveling clothes now look a little shabby. You get ready to stand in line with your father at the counter but realize that there is a person to take you to a table and there is a very long wait. Before you can get a menu to look at while you wait, you hear your father’s name from the very back of the restaurant. It makes you wonder if the policeman from this morning has tracked you down. The voice is from a woman who is sitting in the far back corner. She has said your father’s entire name, including the middle name he hates, so you know that she knows him. When his eyes track to the woman, he looks like he has seen a ghost. The ghost waves him over. It has been a month of Sundays, she says. Longer than that, your father replies. You can’t tell how old this woman is. She looks a little older than you at one glance and then older than your grandmother at the next. Your daddy is nervous again, but not like with the white cop on the road. This is different than you’ve ever seen your father look. You realize that you’ve never seen a man look at a woman in this way. Respect married with fear. Who are these beautiful people with you? My children, your father says, and puts a hand on each of your shoulders. Join me? she says. It is not a question. The waiter appears with menus and waters without so much as a motion of her head. Why don’t you children go wash up and let your father and I get reacquainted? Your father nods, and when you say yes ma’am, the lady lightly touches your hand. You are almost at the bathroom door when you realize that she has put a nickel into your hand. You use the toilet and wash your hands and then take the nickel and the phone number your beau left you out of your brassiere. There is a payphone in the ladies’ room. When you call the number to the rooming house and ask for your lover, the woman on the other end laughs and laughs. Oh, there’s another one calling for Red, she says. You’re the third since lunch. When did she leave you this number, sweetheart? She been gone from here for months. Don’t feel bad. You not the first. When you get back to the table, it is full of food. It looks like the whole menu. You thought when you heard the woman’s rooming-house laughter that you wouldn’t be able to eat, but instead the laughter has made you ravenous. You thought you were hungry for what your lover could teach you, but you were hungry for yourself. When you think this, you look up and the lady is staring at you, smiling. You smile back. 7. Don’t stop. You are almost there. Well, we are headed up to Chicago and are already running behind, so we better get going, your father says. Already late? A few more minutes won’t matter. Why don’t you run me back to the Eureka? My cab driver got a fare, and you know I believe in people making their money. You know I do, she says directly to your father, and you know it means more than one thing at a time. Your father looks at his wrist where his watch should be, and you now know what is missing. Let’s go then. Y’all put all this on my tab, right? Yes ma’am Miss Landlady, they say. Bye now, the workers call out to your father’s ghost. They hand all of you except The Landlady huge paper sacks of food. Those girls are probably starving by now, she says. 8. Are you there yet? You want to go and pick up that lil order at Lucky Heart before they close? The Landlady asks your father. Yeah, I better, he says. I got a package for you too. When you get back she tells him. You remember the Lucky Heart painted on the side of the building from the four-leaf clover insignia from the cosmetics that your mother sells to her neighbors and church members. Your father parks the car in front of the most beautiful house you have ever seen. An older man comes out and gets the food. Your father and brother walk back to pick up your mother’s order. Now this, The Landlady says with a wave of her arms outstretched, is the Eureka. She waits for you to take it all in. So, this is a hotel? you ask. Oh, it is more than that. It is a home, a safe haven, a place to rest, a place to get strong, a place where we practice being free. It’s beautiful, you say. We work at making it so, The Landlady says. Come back to my office, she says. Office? You have never imagined that a Black woman could have her own office. There is a fine wood desk. Shelves with more books than you have ever seen before. The Landlady unlocks a desk drawer with a key that was nestled into her bosom. She takes out a beautiful leather-bound ledger. The pages are a rainbow: green, blue, salmon, goldenrod. This trip to Chicago, do you want to go? she asks. This is the first time anyone has asked your opinion about the situation. Not even your beau. Why do they want you to go? I had a beau who was sometimes a boy and sometimes a girl. Was he good to you? For a little while, yes. But now I don’t think so. Keep the sweet get rid of the rest, I say. And that’s your crime? Yes ma’am? I guess so. The Landlady leans in and takes your hand from across the table. She leads you to a mirror hung on the wall. Straightens your shoulders. Pushes your chin up. What do you want to do with her? She nods at your reflection in the mirror. No one has ever asked you that either. I was learning the guitar. And I can sing a little. There is a restaurant called Moonlight over on Lauderdale. All kinds of folks come through there singing and playing music. Nice man name of Jenkins runs it. If you can hold a tray and serve some drinks it is a good place to learn something before you go over to those wolves on Beale. I only had a few lessons from my beau. And you thought your lil boyfriend was gonna give it to you? A whole entire life? Like he had the keys? I think I did ma’am, you say. The Landlady bends down and opens a desk drawer with a key from around her neck. When she rises back up, she throws handful after handful of key ring sets on her desk. Dozens of keys. Baby, don’t ever let anybody think they got all your keys. First off, they got to earn them. Second, you always keep you a key to a secret place all for yourself. A place you can go to, even if it is just in your mind. When the girl’s father returns, I have the ledgers out on my desk, so he knows what is what. People like me deal in information. We deal in relationships. I knew him and his brother from before. I know enough to know that that brother of his has no business near a fragile young lady. I know where that gold watch he pawned came from. I know where he got the money for that house and farm he’s so proud of. I know the kind of public and private hauling he did around this town. And I know that even though he married a nice COGIC girl, most of the goods that she sells from that Lucky Heart Catalog come from the magical curio section at the back. Just information. Information that he knows that I will use if necessary. I also have a variety of weapons, poisons, and my own prodigious skills at conjure at the ready. If necessary. He knows that too. So, lovie. I am going to ask you, do you want to go to Chicago, go back home, or stay in Memphis for a bit? You are a full human no matter what they say. You get to decide. That’s why we meeting all together. I drum my fingertips a bit on my ledgers for effect. The girl is worn out with deciding. People get to the Eureka and the world has made so many decisions for them that most of them don’t hardly know what to do. We get enough free people in here—singers, dancers, conjurers, and charlatans that they get to try it out for themselves, this choosing. I’m not sure what she will say until she says it. I want to stay at the Eureka for a while. Let’s get you a new name. Without me prompting, she goes to the mirror again as her daddy watches. She considers herself real good in that mirror, perhaps for the very first time. She turns around, new. Good. Then you are welcome here, Flora. You are welcome at The Eureka. They say The Eureka is gone now, like it never existed. Yes, the building is gone, but I see that big wild bush that stands where the building did. I see the offerings that get left when I pass by to the Mississippi. That the Lorraine is still there, called The Civil Rights Museum now, but it is still full of ghosts. They say Lucky Heart Cosmetics has moved, but its mark is still on the building where it was when I was The Landlady. Folk still eating fried chicken and chitterlings at the Four Way. Once a Landlady, always a Landlady, though. See how I’ve been telling you the story of this girl and yourself back and forth through time? The Eureka was then, but the Eureka is now. The Eureka will never be gone. Not as long as there is a single somebody who remembers, a single somebody who cares about Black folk and their comfort in Memphis, Tennessee. I know Black folk in Memphis still need comfort and care. Too much hurt and too much wrong been done not to. Too much joy been made for us not to keep trying. 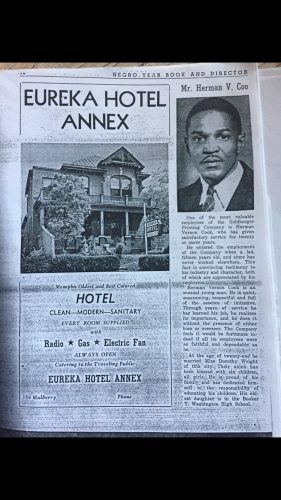 There will always be a Eureka Hotel. There will always be a Landlady. We will not be erased. The Eureka Hotel. Always Open. You are welcome here. Jamey Hatley is a native of Memphis, TN. Her writing has appeared in the Oxford American, Torch, The Account, Long Hidden: Speculative Fiction From The Margins of History, Memphis Noir, and elsewhere. She has attended the Callaloo Creative Writing Workshop, the Voices of Our Nation Writing Workshop and received scholarships to the Oxford American Summit for Ambitious Writers and the Bread Loaf Writers’ Conference. She received an MFA in Creative Writing from Louisiana State University. She made her home in Louisiana for a decade. She wrote her way home to Memphis. She is a 2016 Prose Fellow for the National Endowment for the Arts and a 2016 Rona Jaffe Foundation Writers' Award Winner. Her Twitter is @jameyhatley.